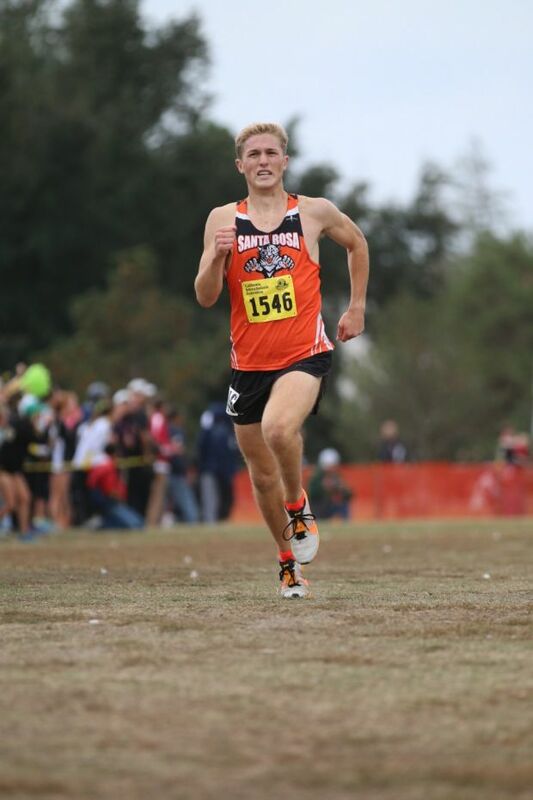 Today we catch up with Santa Rosa senior runner, Luca Mazzanti (photo to the left is courtesy of ca.milesplit.com and Ben Crawford). This past Saturday, Mazzanti was the top NorCal placer in the Division II race with his 5th place finish and 15:24.3 time. Earlier this season, Mazzanti finished in 25th at the Stanford Invitational seeded race. He went on to win the NBL championship and then finished in 5th place at the NCS meet with a time of 15:20.3. During the Track and Field season, Mazzanti finished in 4th place at the NCS MOC meet with a time of 4:18.21, just missing the state Track and Field meet. He followed that up with a very fine Steeplechase effort over the summer as he ran the 2nd fastest time in CA history in the 2000m Steeple with a time of 5:54.96. 1) You finished in 5th place at Saturday's CA state meet. Heading into the meet, what place did you think you could finish if you ran well? Heading in I thought I was for sure in the top 20 and had the potential to move up. My fitness was still going up every week and I felt great on my runs so I had a "perfect day" goal to crack the top 10. 2) What was the plan heading into the race? Did you have a pace in mind for the first mile/2 mile? Did you have any runners that you could shadow? I really wanted to focus on being conservative in the first mile and be able to chase people down in the last mile or so. My coach had me pick 3 spots to make a move and that worked really well because it also kept me mentally engaged in the race. I had sort of a vague idea to look for the Dublin guys because I thought I could stick to them for a while. 3) What was your place and time at the mile mark? How did you feel at that point? My plan was to hit the mile in 4:50 and I crossed it in 4:52 so at that point I felt really relaxed. I was probably in 30th or so at that point and that is when I started moving up and picking people off. 4) Did you have a pretty good idea of your place throughout the race itself? How tough was the last mile? When did you start your drive for the finish line? When did it sink in that you finished in 5th place? What was your place and time in the Division I race last year? I started to notice my place when we got to the big hill. I saw that there weren't a ton of people ahead of me so I started to pull up to the lead pack and was a few meters behind them when we reached the 2 mile mark. I actually felt really good for the last mile. I made a move on the rolling hills in the back and caught up to the leaders. I didn't want it to come down to a sprint so I started a long drive to the finish and that's when the pack broke and started going for it. I didn't have my normal kick but I sort of had the jump on a few of the guys so I was able to hold them off. It really sunk in when I saw my coaches and they were ecstatic about my race. I think my time last year was around 16:30 or so and 98th in the race. (editor's note: he finished in 105th with a time of 16:28.3) You could say this year went a little better. 5) When did you start running and when did you first realize that this is the sport for you? I started running in 7th grade but it was mostly to get in shape for soccer and hang out with friends. Freshman year I was going to play soccer and not run cross-country but a friend convinced me to come to a practice and I loved it so I chose to run instead. That year I ran some pretty good times and decided to do running a little bit more seriously. 6) Did you do anything differently over the summer as you prepared for this season? I raced the steeplechase this summer which was tons of fun. It meant I ran a lot less miles but I got to get in some really fun races and workouts so it was a good trade. 7) What about your training during the season? What was your typically weekly mileage? Any key workouts? Distance of your longest run? Pace of most of your road runs? Did you have to do most of your runs/workouts on your own? I am a pretty low-mileage guy so I didn't do a ton of super long workouts. I started doing double days twice a week which probably bumped up my mileage to around 45 a week. I took a nasty fall while running the day after Stanford and hurt my hip pretty bad. I couldn't run for 2 weeks so that set me back a little but I cross trained and kept up my fitness relatively well. We have 2 key workouts in cross-country. One is an adapted version of what one of my coaches ran at Michigan. It's called the Michigan and is meant to simulate a race. The other is called Cobblestone and is a tempo/ hill workout. We keep records of both so it's nice to look back and see what you ran as a freshman. I think I got one run in that was 12 miles but I backed off after I hurt my hip and didn't get back above 10. I usually run around 7:00 pace and cut it down to 6:30 pace by the end of most runs but it depends on how easy I am supposed to take it. I usually run with one of my friends but he was hurt this season so I was on my own for most runs, at least for the majority. It's not as fun but in a way it forces you to focus more. 8) Tell us about your coaches and how they have helped you get to this point in your running career. 8) My coaches are awesome. I would not even be close to this point without them. Doug Courtemarche and Carrie Joseph work together so well and have a great system in place to help us develop as runners. They put emphasis on being able to develop past our high school years and making sure we don't burn out. Our newer coach (in comparison to Doug and Carrie), Kevon, is super knowledgeable about strength training and nutrition stuff so he's been a huge help in staying well rounded. The best thing about my coaches is how they encourage the team to be better in all aspects of our lives and not just athletically. 9) Favorite XC course? Favorite XC invitational? Favorite XC workout? Favorite long run? Favorite TF event? Favorite TF invitational? Favorite TF workout? Favorite movie? Favorite free time activity? My favorites have got to be Mt. SAC for invitational and course just because of how challenging it is. My favorite workouts are tempo runs at our home course. In track I have to say steeplechase is my favorite event because it mixes up the race. I also like the 1600 because it's tactical and fast and I love to have a strong kick at the end. My favorite track meet is the Big Cat meet that my school hosts because it's a ton of fun to race so many people on your home track. My favorite movie would have to be Anchorman. I love to go backpacking when I am free on the weekends. 10) Have you made your college decision and if not, how much of a factor will running be when it comes to selecting your college? I've narrowed it down to a handful of schools but no decisions yet. My priority is academics but running is one of the important factors I am taking into account. I hope to find a school that helps me to develop as a runner without sacrificing my academics. 11) Looking ahead to the Track and Field season, any meets that you are looking forward to and any goals you want to share? I am really excited about our DMR this season and think we will be able to mix it up with the best teams at Arcadia. I also want to break 4:10 in the 1600 and see how competitive I can be. Maybe get into some steeplechases. But that's hard because there are not many around. If you know of any let me know. I think I could run a decent 3k steeple time. It's been a good cross-country season. Hopefully track is just as exciting. Thanks so much for running such a great site. Congratulations and Best Wishes to Luca! Question: Did Daniel Pride run for Santa Rosa this season? I thought he was a junior last year and NBL champion? Daniel Pride was injured this past season and did not race at all. He is on the mend and hoping to be racing in the spring.